Matt Eberhart is an agent for the CIA. He served for many years in the USAF where he attained the rank of Lt. Colonel before retiring. While in the service he was trained in survival techniques as well as numerous ways of killing, not the least of which was behind the controls of a jet fighter. Rugged Special Forces courses mixed with flight duty making him an excellent killer on or above the ground. His exploits won him several prestigious medals, including the Bronze Star and the Silver Star. After he left the military, Eberhart moved to the diplomatic world where he was eventually stationed in Cambodia. After a year of their frequent asking, he brought his family over to live with him. Unfortunately, a suicide pilot trying to kill the Cambodian President missed him but the bomb killed Eberhart's wife and severely disabled his son. Once he had buried his wife and placed his son in a V.A. hospital, Eberhart returned to Cambodia where he proceeded to take part in operations far beyond the normal duties of an embassy employee or an air attache. He participated in numerous ground patrols deep into the jungle seeking out the burgeoning Khmer Rouge rebels. Eventually it proved a hopeless task and Eberhart was sent home to the U.S.
With his wife dead, his son in a constant vegative state, and nowhere to vent his anger and frustration, Eberhart turned to alcohol for solace. Now the years of hard drinking and near suicidal lifestyle have made him seemingly the last person someone would ask for help. Then a mission is offered, one that would bring with it the chance of aiding his son and he realizes there is more to life than self-pity. It takes a short while but Eberhart regains the skills that made him one of the Agency's best men and makes him a danger to those in his way. To earn money for his son's medical problems, Matt Eberhart agrees to return to Cambodia to look for a pouch of diamonds and vital documents with them. Others are already looking for them as well. Working for a secret arm of the CIA, Matt Eberhart infiltrates an Arab terrorist group to help bring it down. To prove himself to that group, though, he has to take part in a nuclear strike. When word comes of MIA still being held in Vietnam years after the war, Matt Eberhart is determined to get them out. 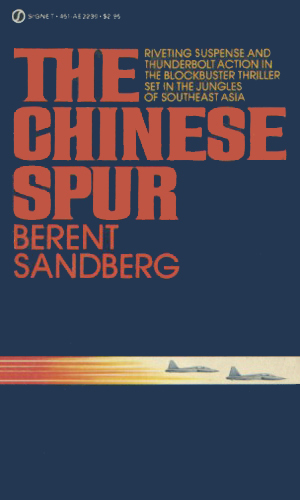 A Chinese general is determined to start the war all over again and is using Eberhart's girl friend as bait. Perhaps Eberhart is a bit too good but you quickly ignore this as the action and the story is so interesting you are willing to forgive a lot. The three adventures are quite a bit different, though the middle one, joining an Arab group, is a bit of a stretch. I liked all of them and was sorry there weren't more. 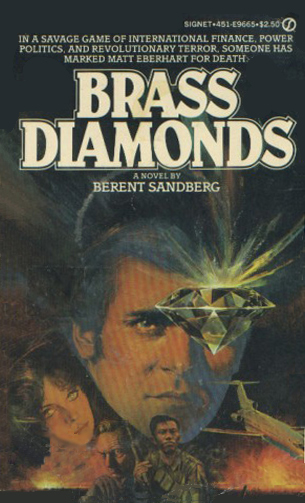 The authors who comprise the pseudonym of Berent Sandberg make an interesting story, too, according to the blurb in the first book. They had first met in the 60s in Arizona and became friends. 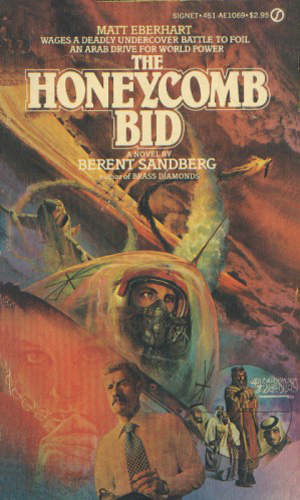 Then Mark Berent left to fly jets in Vietnam while Peter Lars Sandberg headed to the nation's capitol to protest the war. Later they would reunite, renew their friendship, and write three action adventures with Mr. Berent providing the combat experience and Mr. Sandberg the writing skills.